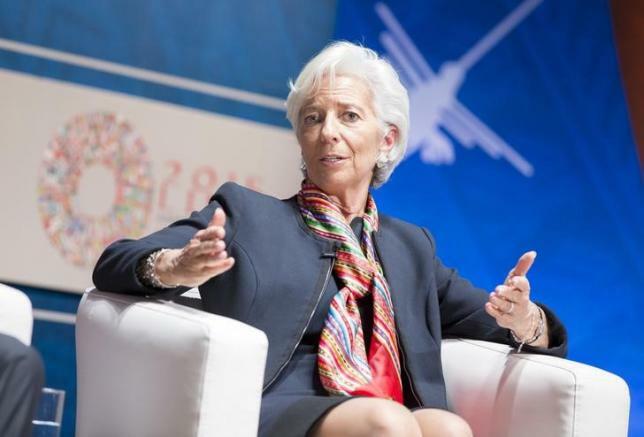 International Monetary Fund chief Christine Lagarde said on Thursday the global lender may push ahead with interim steps to give emerging markets a bigger say, despite a stalemate in the US Congress over approval of broader governance reforms. Reforms agreed in 2010 would put Brazil, China, India and Russia among the fund's top 10 shareholders, but they still need approval from the US Congress, frustrating emerging markets that pushed hard for more voting power, and prompting warnings from Europe about the dangers of US isolation. IMF policymakers have said they will come up with ideas on how to push ahead with reform by mid-December. Lagarde said time was slipping by. "If it lasts for a little longer, we will have to look at an alternative solution," she told a news conference, adding that this would not be a substitute for full-fledged reform. One option is an ad hoc increase to the quota for key emerging economies, without requiring any change in the US position, although the Group of 24 developing economies kept up pressure for a more radical alternative. Taking halfway steps would reduce pressure on Congress to ratify the changes. The Bank of Mexico's governor, Agustin Carstens, who chairs the IMF's advisory panel, told Reuters: "The best possible result would be for the US to deal with it .. that's the first-best option and we are hoping for it to materialize." Even an ad hoc increase would need backing from Washington. Asked if the United States would support interim measures, US Treasury Secretary Jack Lew said there were no second-best options. "I think there is both an understanding of the necessity, and a growing comfort with an approach, and a sense of necessity, to deal with it," he told reporters. "Normally when things are hard to do, it is when they are seen as necessary that they get done." Jeroen Dijsselbloem, who chairs monthly meetings of the eurozone finance ministers, said the United States had to take responsibility again for international financial institutions. "I would say it is in the US interest to do that," he said. "They should not be isolated, especially not as China is becoming more and more active in our institutions, which is welcome."